After borrowing a CurrentCost electricity usage meter from my local library (if you’re in the area, then Eastleigh library will loan you one for free! ), I decided to buy one, as I’d found it very useful in trying to reduce my electricity usage. The benefit of buying one as opposed to borrowing one was that I could start connecting it to a computer and logging data (the one I borrowed didn’t come with a connection cable). Check what serial device the USB-to-serial adaptor (which is built-in to the cable) is coming up as by running dmesg and checking the final lines of the output. A similar command should work on OS X, and on Windows you should be able to check Device Manager and see what COM port number it has been assigned. In my case, it was /dev/ttyUSB0. Test it using a serial communication program. For example, on Linux I ran sudo minicom -D /dev/ttyUSB0 -b 57600 (the last argument is essential as it sets the baud rate correctly for the device). On Windows something like Hyperterminal could be used. I’ve written the Python code below to read the XML over the serial connection, parse the data and return it. You’ll need to install pyserial and untangle (a handy XML parsing library for simple, small bits of XML) first using pip. Looking how to connect my EnvirR to my FreeNAS server just found your blog and I really love how simple you made it. 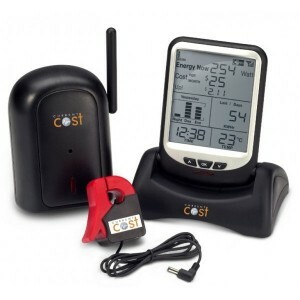 I plan to set up a jail to host the collector, the database and even a small web server to show graphs and so, just like I did with my meteo station. I really really hate the current cost web service, it’s too much simple and for free I can only see the main channel. I have 5, and I believe that no way can be that expensive for them to show five channel data as they pretend to charge, so the way to go is my little freenas box. Keep on with the rest of the article, let’s set up a nice server where we don’t depend of third parties. Just for you to know, as I’m no python expert, after looking all around the web yours is the only example using untangle, which I find amazingly easy to understand and modify to fit my needs. Right now I’m trying to use your code to feed an emoncms server I’m also trying to set up (without too much luck ATM). a lot of the links here are sort of out of date now, btw 🙁 … even in just a year. Note I made a small amendment to allow for multiple devices connected to the EnviR.